END-OF-LIFE PROGRAMS, PARTS, BANKS, SERVICE PARTS AND MORE CRITICAL AND UNIQUE APPLICATIONS WHICH REQUIRE EQUALLY UNIQUE PROTECTION. Unique and Custom Packaging Solutions to Meet All Client Requirements. As the world’s only vertically integrated manufacturer with Accredited Laboratories and Chemists, Cortec® offers MPG the ability to meet all specific client requirements and specification to solve any corrosion related challenges anywhere in the world. OEM approved heavy duty barrier-foil with VpCI laminated structure is ideal for long term (10+ years) banks, service parts and more. 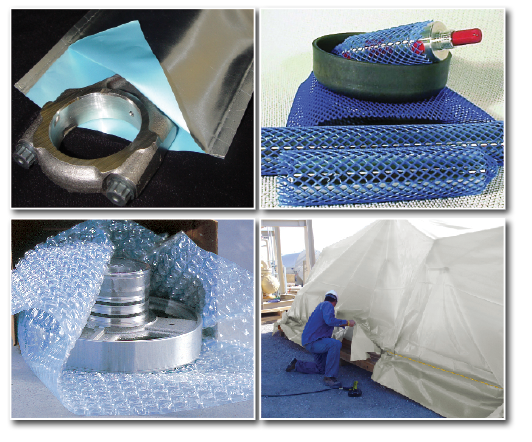 CorrNetting™ combines physical cushioning protection for sensitive mechanical parts. Effective, efficient and ideal for protecting sensitive components. Cortec EcoWeave is a woven polyethylene film which offers extra strength, durability and reusability.